Would you like to know all about British seas and the kind of creatures that live in them? Want to see seahorses, octopus, lobsters and other exciting British marine animals up close and learn all about them? Then this is the place for you! As well seeing all our animals, you can learn all about British marine habitats and the research and conservation work which is helping to save them, including our British seahorse breeding programme and the Lobster Hatchery of Wales. Explore British marine habitats including incredible invertebrates in the No Bone Zone, the wolf fish lair, a real crashing wave, a creepy shipwreck and a kelp forest full of big huge fish. Whatever the weather and for all ages it’s a fun and educational experience! Learn about marine life with daily talks with our marine biologists! We also have exciting interactive packages for groups and schools, from tours and rock pool rummages to presentations and interactive sessions. 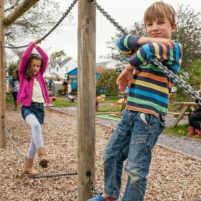 Free adventure playground, giant Octojump bouncy castle with slide, crazy golf and outdoor picnic sites. Stroll along the shores of the picturesque Menai Strait with a backdrop of the Snowdonia mountain range. 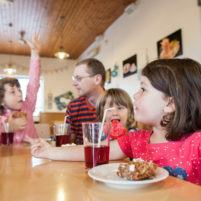 Enjoy delicious home cooked cakes, snacks, meals and daily specials all made from the best locally sourced produce in our fully licensed café. Visit our superb gift shop, well stocked with a huge range of gifts, souvenirs, toys, confectionery and local produce. We guarantee there’s something for everyone! Non aquarium visitors are always welcome in our café and gift shop. 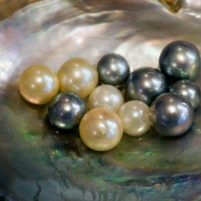 Choose your very own pearl oyster in our Gift Shop and watch while it is opened, cleaned, valued and even set in jewellery. A very unusual gift for you or someone special. All standard and family tickets are valid for 6 days after day of purchase so you can see your fishy friends and marine mates again and again for free in the week following your first visit! A great deal for families! "My family and I spent a day at the Sea Zoo recently, and I just wanted you to know that we had a wonderful day. The displays were fascinating, even for my lively 3 year old grandson, who was mesmerised by the fish swimming under his feet! We had a lovely lunch in the Bistro, then the adults had a rest while the children ran off energy in the playground. The pirate ship was a particular hit. The gift shop was our last port of call, and I even found some things I liked, which is rare, so have a few permanent mementos of a really brilliant day, which didn't cost the earth.